All products made in EU by artisans!Products are not in mass production and avaible only in specialized shops. 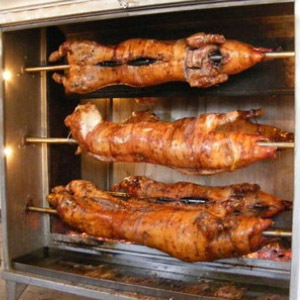 Pork or lamb rotisier , is equipped with two, four or six stainless steel rotisserie rods, with forks for fixing roast, pan (two) for the alloy of fat and 12 volt halogen lights in several places for night vision, and the wheels diameter 125 mm. 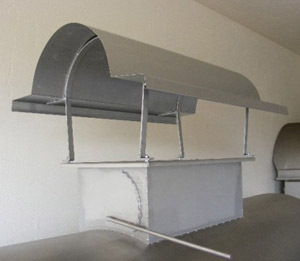 Flue connection can be carried out according to customer demand, and the chimney has a damper for controlling the flow of smoke. Instead of metal front doors, roaster can be equiped with toughened glass +850 c.
Drive lamb is derived through a chain sprocket. 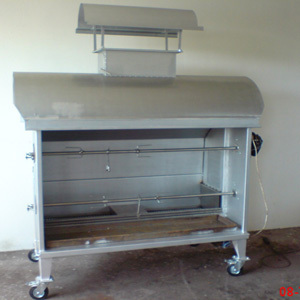 Roaster is designed for burn charcoal or wood. 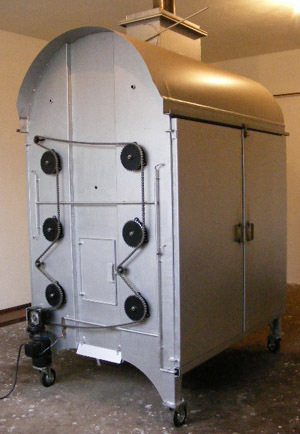 Firebox is protected from burning easily with interchangeable double-bottomed. The stove is painted with Alu-resistant color. Consumption of charcoal is about 3.5 kg / hour. 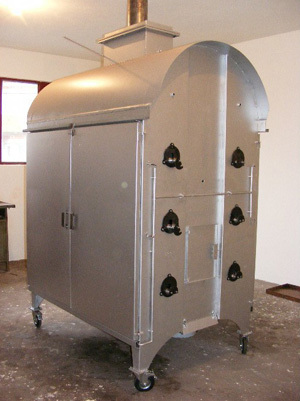 Pork or lamb roast oven with six rods large = 170cm, deep = 115cm, high = 230cm without wheels. Weight approx 330kg. 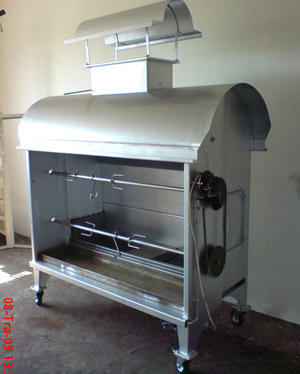 Pork or lamb roast oven with two rods large = 170cm, deep = 90cm, high = 180cm without wheels. Weight approx 180kg.